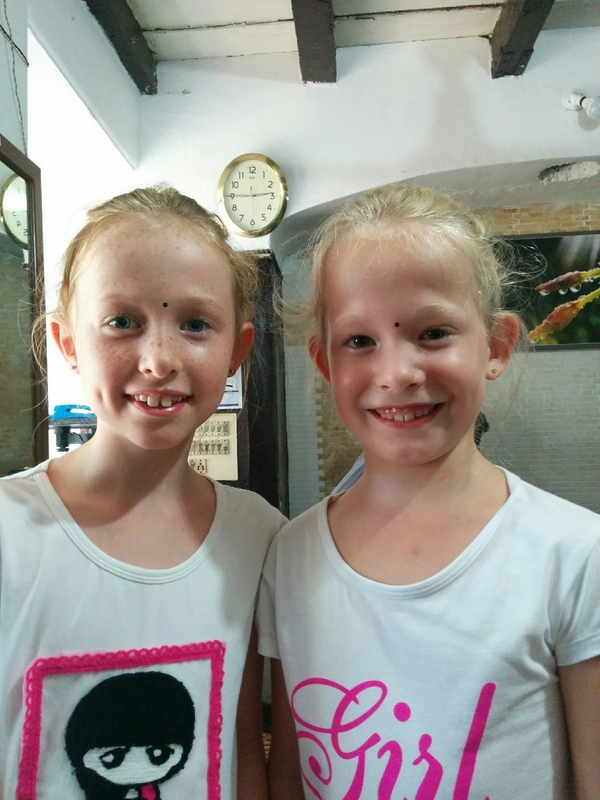 Yesterday we left south east Asia after an exciting and fascinating stay in the region and flew west to India. We’re three and a half months into our trip; we’ll spend 10 weeks here before going to southern Africa in March. 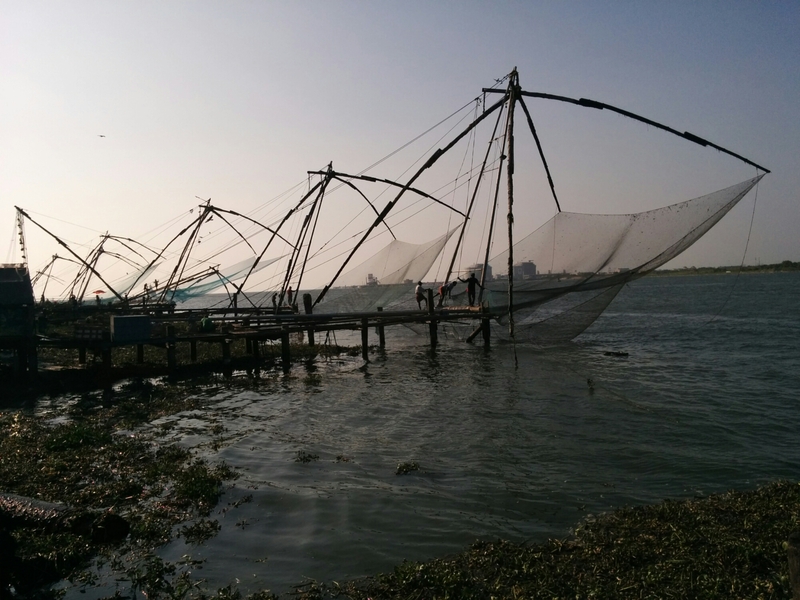 We are now in Fort Kochi in Kerala. The state of Kerala, known as God’s Own Country, is in south India on the Malabar (west) coast. In all of India, Kerala boasts the highest Human Development Index: 0.790 in 2011; the highest literacy rate: 94%; and the highest life expectancy: 77 years. 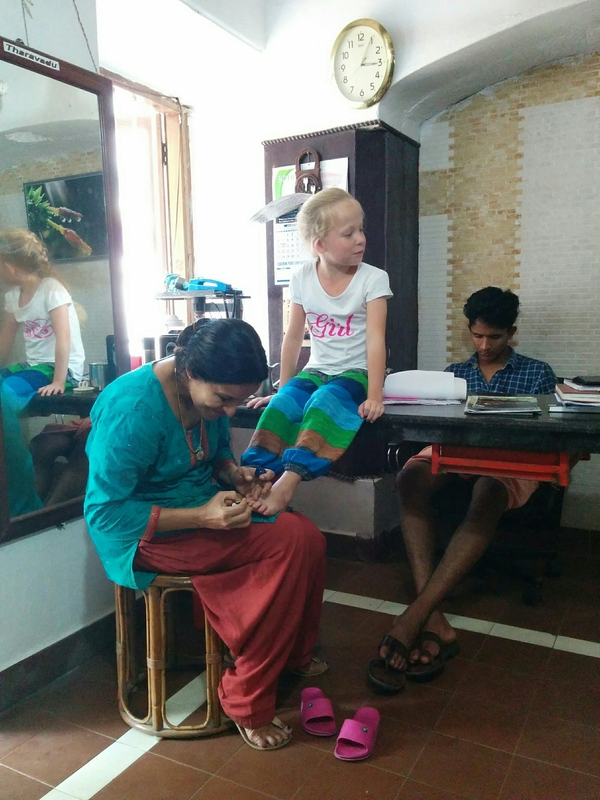 Kerala’s economy is boosted by remittances from its large expatriate community (the state experienced significant emigration to the Gulf states during the 1970s and early 1980s). Also important contributors to economic output are agriculture (coconut, tea, coffee, cashew and spices), fisheries and tourism (beaches, backwater tours and ayurvedic medicine are major attractions). Christmas is coming and we want to make the season festive for the girls. 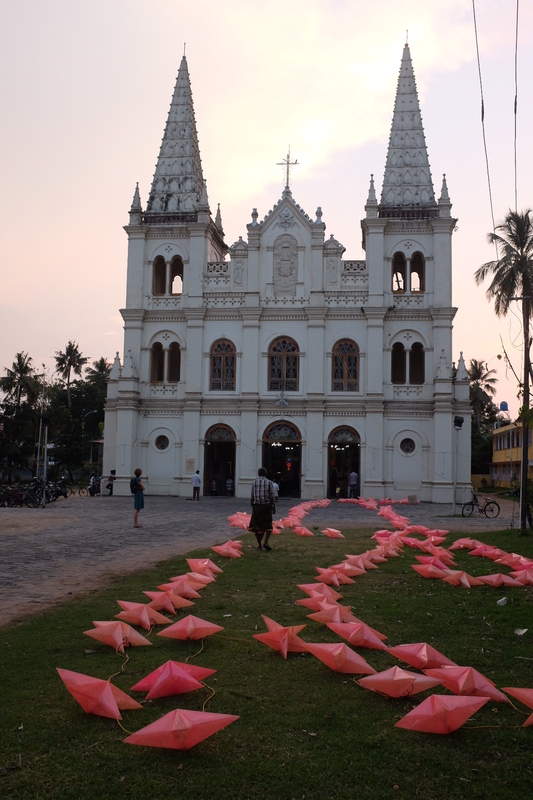 Kochi was occupied by the Portuguese in 1503 and to this day, the Portuguese influence continues to be felt. This means there will be a significant community celebrating Christmas. This church, below, is getting its lights ready for the big day. For us, Christmas typically means spending time with family. And since we’re a long way away from home, we decided to find a comfortable homestay arrangement here. This turned out to be a great decision. Our generous hosts, Linda and Thomas, have taken us under their wings. They also seem to know everyone in the community, so their wings are broad and inclusive. From the very beginning, Linda and the girls hit it off (she’s like a fun bossy aunt and the girls do precisely what she tells them to do!). Yesterday, Linda took us to her sister’s (Minda) place for lunch. 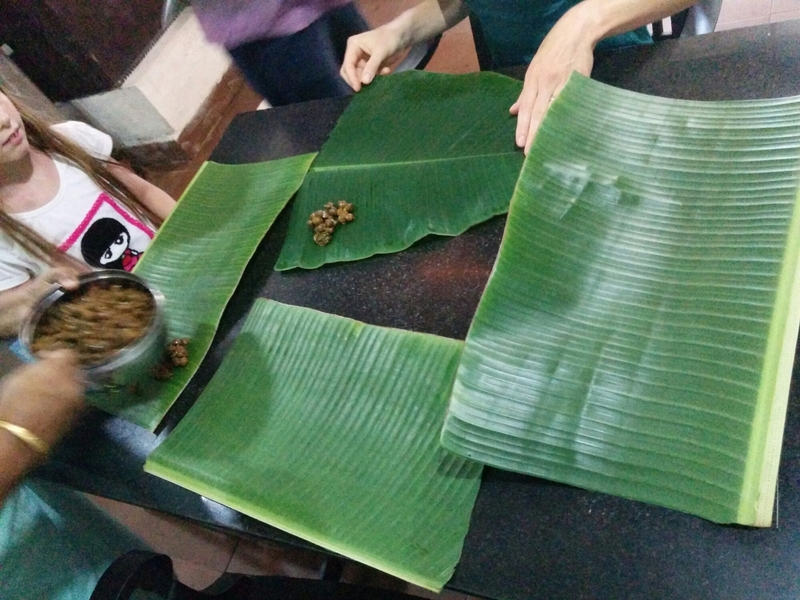 Here are the banana leaves that would be our plates for a delicious veg thali. They’re like big green canvases, painted with delicious flavors. Minda prepared a feast. Linda even showed us how to eat with our hands. 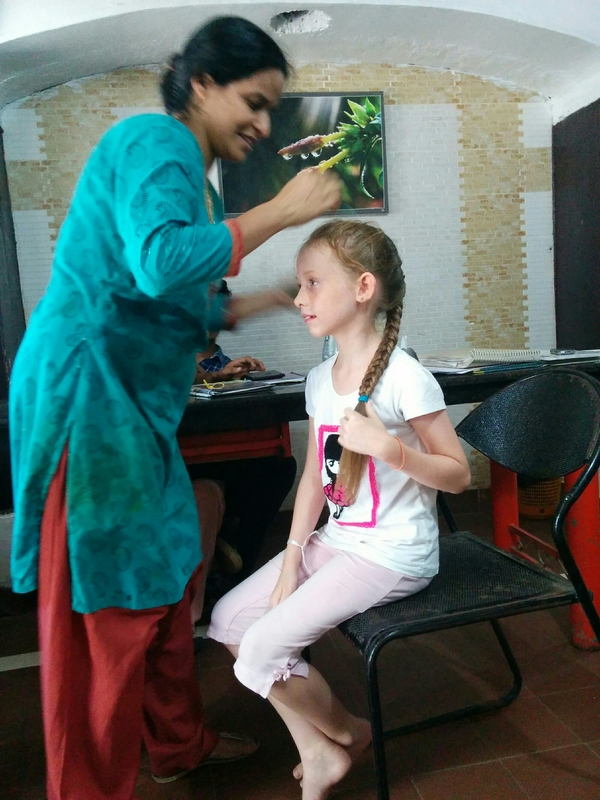 After lunch, Minda gave the girls a makeover; hair and nails and a promise that when we come back the next day, she’ll have another hairstyle for them to try. 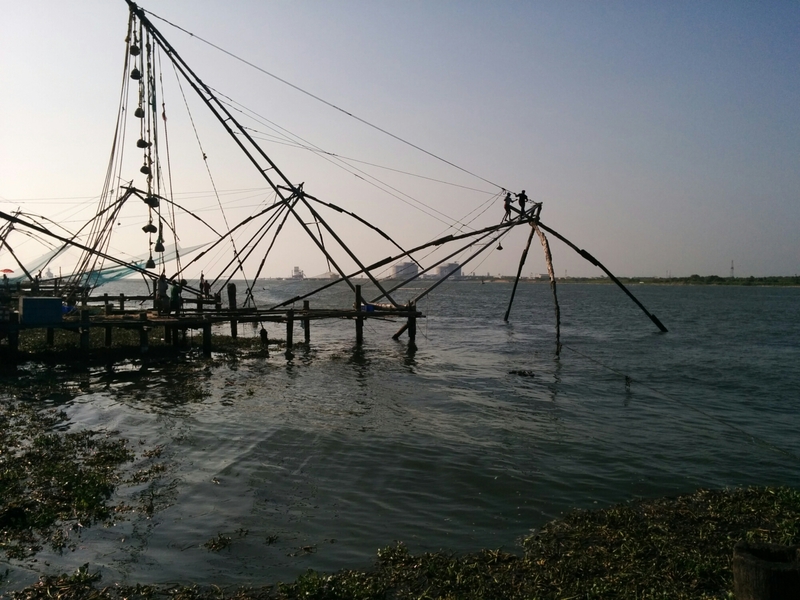 Known as the Queen of the Arabian Sea, Kochi is located right on the coast. The Chinese fishing nets on the beach make an iconic picture of the city. The structures are 10m high and hold out cantilevered horizontal nets that are 20m wide. Large stones suspended from ropes act as counterweights. Each installation is operated by a team of up to six fishermen. Below, the net has been lowered and two fishermen stand on top of the frame to push the nets further into the water. Below, the nets have been lifted. A fisherman scoops the catch into a smaller net. 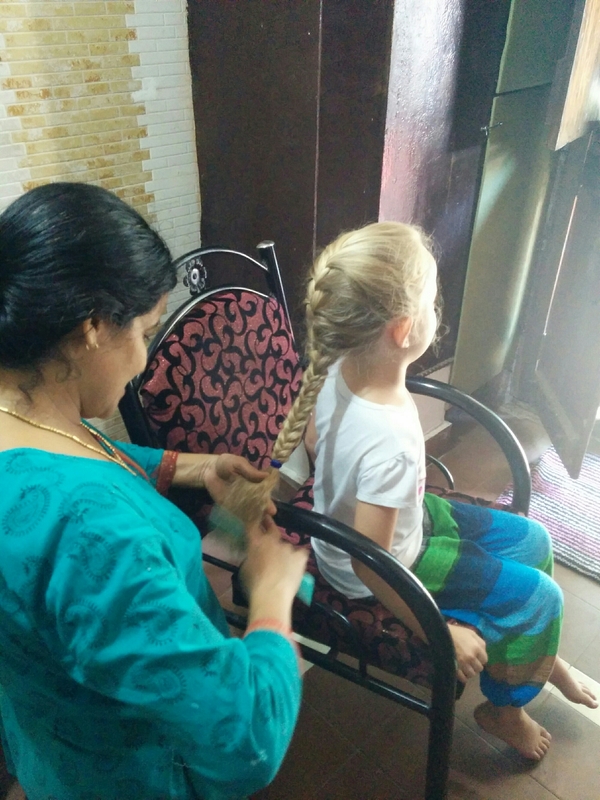 We have settled in to a great arrangement in Kochi. There is so much to see and learn. We’ll share more impressions from this rich, spicy and colorful place in further posts. 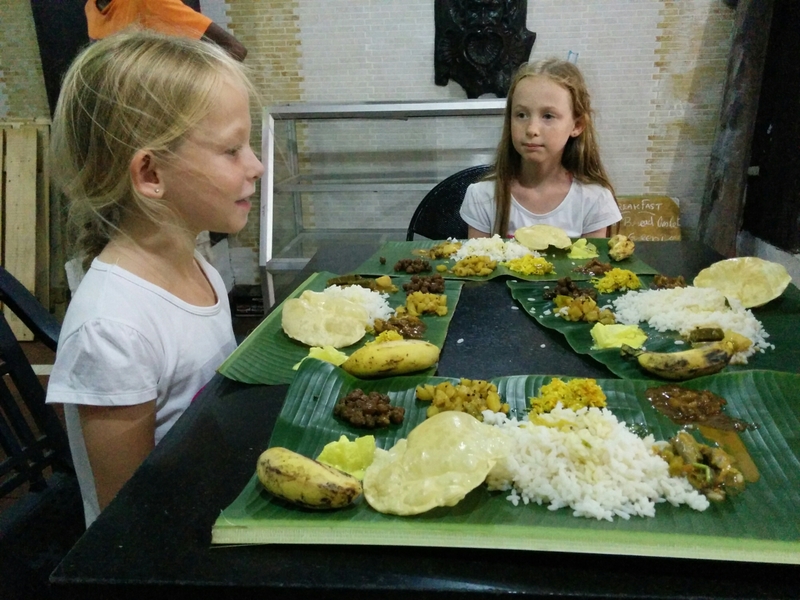 I’m so happy to hear you’ve arrived in Kerala! The girls look lovely in their pictures. Enjoy! What an experience – we so love getting your posts and being there with you vicariously. We miss you guys and think of you often. We are gearing up for Christmas – it has been crazy here at work and at home but next week should slow down. We can hear the excitement and joy in your voice as you join together with a lovely family to share Christmas together in Inda. We have so enjoyed feeling the sights, sounds and tastes of DaNang with you and know that after 3.5 months traveling you are fully tuned into each day. We are so inspired and proud of you all for your compassion and cultural awareness. We vent to Grundtvigskirken to hear Axel singing in the Danish Boys Choir with Klaus and Mia, and Marie and Henrik. X-mas is all around us and we miss you, Louise and Nigel, and Lotte and John. Looking foreard to meet you all in Botswana in three months. 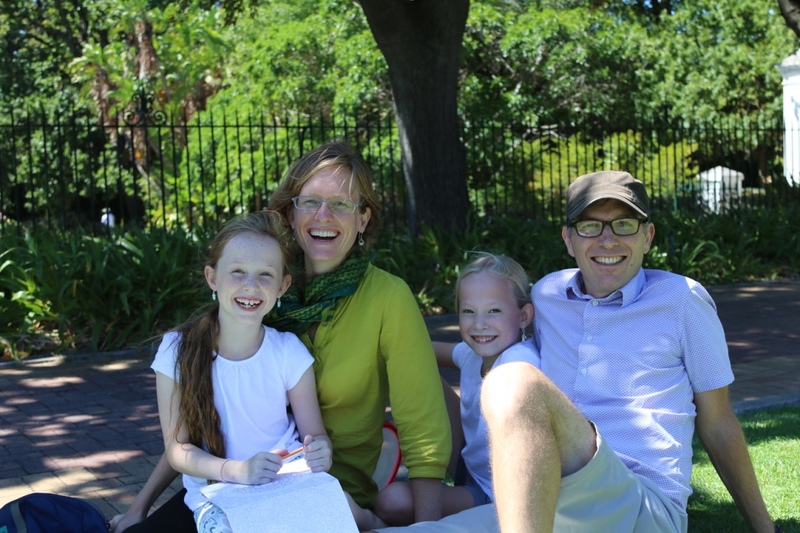 Merry Christmas Louise (and family) – have enjoyed your updates so far. Sounds like an amazing trip! All the best for 2016! Look forward to your return! Merry Christmas Nigel and Louisa and the girls. We love your blogs.